Looking for customized silicone wristbands? At WristbandConnection.com, we offer 100% silicone wrist bands and silicone bracelets at an affordable price. Our easy to use wristband maker allows you to customize your design in minutes. We offer many different style bracelets to choose from such as debossed, embossed, ink filled, and screen printed wristbands with a large selection of fonts and custom clip art. Want to use your own logo? Call us at 800-451- 9711 to speak to one of our experienced team members to assist you in creating your customized design. We offer 24 hour rush production on many of our personalized silicone wristbands. Don't settle for cheap wristbands. Did you know that some manufacturers supplement their silicon wristbands with latex to save money? This practice results in poor quality and can seriously endanger their customers. We only use the best bracelet silicone materials. We are proud to be the #1 no minimum order silicon wristband company in the USA. Whether you are looking to create 1 silicone bracelet for yourself or millions of customized wristbands for a cause, we are happy to help you meet your needs. Click here to design your own rubber bracelet today! Did you know that silicone wrist bands are the number one selling fundraiser item? Call 800-451-9711 and ask about our bulk discounts and wholesale specials. Looking for a custom color? We can produce wristbands in any color you can think of with a minimum order of only 100pcs. Order you custom silicone wristbands today! Our bracelets silicone warehouse stock hundreds of thousands of wristbands to provide you with the option of guaranteed 1 day production. 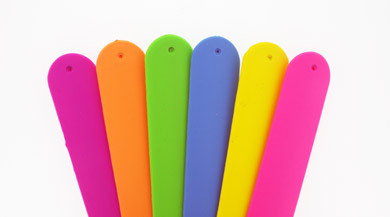 For over 10 years we have helped customers buy silicone wristbands at an affordable price. Ask us about our cheap silicone bracelets that are in stock and ready to ship. Start designing your silicone bracelet now!